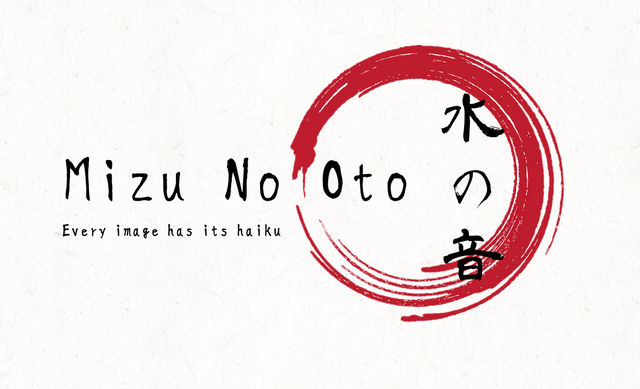 Welcome to the 25th edition of the Mizu No Oto contest, haiku friends! This is an unique place on Steemit, where we try to understand more and more deeply this elegant form of poetry, and enjoy writing and reading together in a fantastic atmosphere. We had more than 500 entries so far, and we distributed nearly 100 @steembasicincome shares as prize, plus some SBD and STEEM. We are very proud of this success, and we intend to continue better and better. 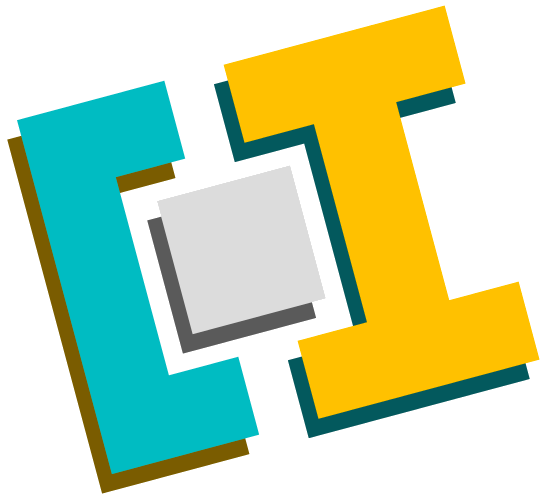 ¡Bienvenidos a la 25ª edición del concurso Mizu No Oto, amigos del haiku! Este es un lugar único en Steemit, donde intentamos comprender cada vez más profundamente esta elegante forma de poesía, y disfrutamos escribiendo y leyendo juntos en un ambiente fantástico. Tuvimos más de 500 entradas hasta el momento, y distribuimos cerca de 100 shares de @steembasicincome como premio, y algunos SBD y STEEM màs. Estamos muy orgullosos de este éxito y tenemos la intención de continuar mejorando siempre. • Look at the prompt image and let yourself be inspired by it. • Write a haiku related to the prompt image. The haiku should be composed by 1-3 short verses with no title. The classical haiku form is 3 verses of 5/7/5 syllables, but other forms are allowed, as long as they remain in absolute brevity. • The haiku should be in English or include an English translation. • Post the haiku on your blog or in the comment section below this post. If you make your own post, don’t forget to put the link to it in the comment section below! • Kireji (切れ字), a cut between the 1st and the 2nd verses, or between the 2nd and the 3rd; the cut can be grammatical, as a sign of punctuation, or it can be a cut in the meaning, like two different images. • Kigo (季語), an explicit or implicit reference to a season, that defines the time of the year in which the haiku is composed or referred to. • Sabi (寂), the sense of the inexorable passage of time, the beauty or serenity that accompanies the advance of age, when the life of the objects and its impermanence are highlighted by patina and wear or by any visible repairs. • Wabi (侘寂), the taste for frugal and natural things, rustic simplicity, freshness or silence; it can be applied to both natural and artificial objects, or even non-ostentatious elegance. • Mono no aware (物の哀れ), empathy with nature and human life; the "feeling of things", nostalgia, regret for the passing of time, understanding of the changeability and of the transience without suffering. • Yūgen (幽玄), sense of wonder and mystery; it represents the state of mind produced by the inexplicable fascination of things, the feeling of an 'other' universe, full of mysterious unity. • Karumi (軽み), beauty in simplicity; poetic beauty reflected in its simplicity, free from preconceptions and moral judgment. • Shiori (しおり), gentleness; the levity and the delicate charm that radiates from the verses, where things are evoked in the reader without aggressiveness or excessive explicitness. Submission deadline: Wednesday 27th March, 10:00 PM, GMT +1 (Rome Time). The results will be out on Thursday 28th March, 10:00 PM, GMT +1 (Rome Time). Today's in-depth analysis is very short, because, alas, time is a tyrant. I would like to continue the discussion on the formal characteristics of haiku, talking about how the Japanese on are a little different from our syllables and why haiku should avoid the rhyme schemes. A mora (plural morae), is a unit of sound used in phonology, which determines the quantity of a syllable, which in turn - in some languages - determines the accent. In our Indo-European languages, such as English, Italian or Spanish, accents are essential to determine the poetic metric. For example, the Italian hendecasyllable verse, in addition to having 11 syllables, must have a tonic accent on the 10th and another tonic accent that falls either on the 6th (hendecasyllable a maiore) or on the 4th (a minore). This is not true in Japanese, because the Japanese morae (on, 音, "sound"; also, outdated term: onji 音字) have no tonic accent. Each on has an accent exactly like the others. Therefore, it is impossible to create rhyming schemes. A rhyme is a repetition of the same sound in the final stressed syllables, and of any following syllables, of two or more words. But if there’s not a stressed syllable, it’s impossible to conceive the rhyme. Even if this were not the case, however, the desired repetition of sounds, assonances and the choice of refined terms are considered since ancient times in Japan as "poetic evils", because they hinder the spontaneity of the poetic dictation, through artifices of musicality and intellectual reworkings. It can certainly be said that haiku sensibility does not like too much processing of text. Poetry must flow almost instantaneously and free as a stream. Next time I'll talk about kireji, another thing that is very different in Japanese and in our languages. Have a nice week, and drop some good haiku to honor the beautiful photo by Calluna! El análisis en profundidad de hoy es muy corto, porque, por desgracia, el tiempo es un tirano. Me gustaría continuar la discusión sobre las características formales del haiku, hablando de cómo los on japoneses son un poco diferentes de nuestras sílabas y por qué el haiku debería evitar los esquemas de rima. Una mora (plural morae) es una unidad de sonido utilizada en fonología, que determina la cantidad de una sílaba, que a su vez, en algunos idiomas, determina el acento. En nuestros idiomas indoeuropeos, como inglés, italiano o español, los acentos son esenciales para determinar la métrica poética. Por ejemplo, el verso endecasílabo italiano, además de tener 11 sílabas, debe tener un acento tónico en la décima y otro acento tónico que caiga en la sexta (endecasílabo a maiore) o en la cuarta (a minore) . Esto no es cierto en japonés, porque los morae japoneses (on, 音, "sonido"; también, término obsoleto: onji 音 字) no tienen acento tónico. Cada on tiene un acento exactamente igual que los demás. Por lo tanto, es imposible crear esquemas de rimas. Una rima es una repetición del mismo sonido en las sílabas acentuadas finales y de las siguientes sílabas, de dos o más palabras. Pero si no hay una sílaba acentuada, es imposible concebir la rima. Sin embargo, incluso si este no fuera el caso, la repetición deseada de sonidos, asonancias y la elección de términos refinados se consideran desde la antigüedad en Japón como "males poéticos", porque obstaculizan la espontaneidad del dictado poético, a través de artificios de musicalidad y reelaboraciones intelectuales. Ciertamente, se puede decir que la sensibilidad del haiku no le gusta demasiado el procesamiento del texto. La poesía debe fluir casi instantáneamente y libre como una corriente. La próxima vez hablaré de kireji, otra cosa que es muy diferente en japonés y en nuestros idiomas. ¡Que tengas una buena semana y un buen haiku para honrar la hermosa foto de Calluna! My first haiku ever! Thanks for expanding my horizons with contest. As for @theironfelix, you put me in great indecision. What haiku should I consider for the contest? Multiple entries are difficult to manage, I don't want someone think they can easily increase their possibilities submitting more than one haiku. I think I will choose the first one, it's the one I feel more close to the haiku language! Dropping the haiku here now, before tucking in for bed. A down payment on further comment. I really liked this haiku, @vdux. By using the verb confirm, you poetically invert what we usually do: it's not nature turned into a metaphor for life, but life turned into a metaphor that trees confirm. The best thing I can say about @calluna's picture is, I want to be there. I want to rest there. A great Italian poet and songwriter sang: "nothing is born from diamonds, flowers are born from manure". 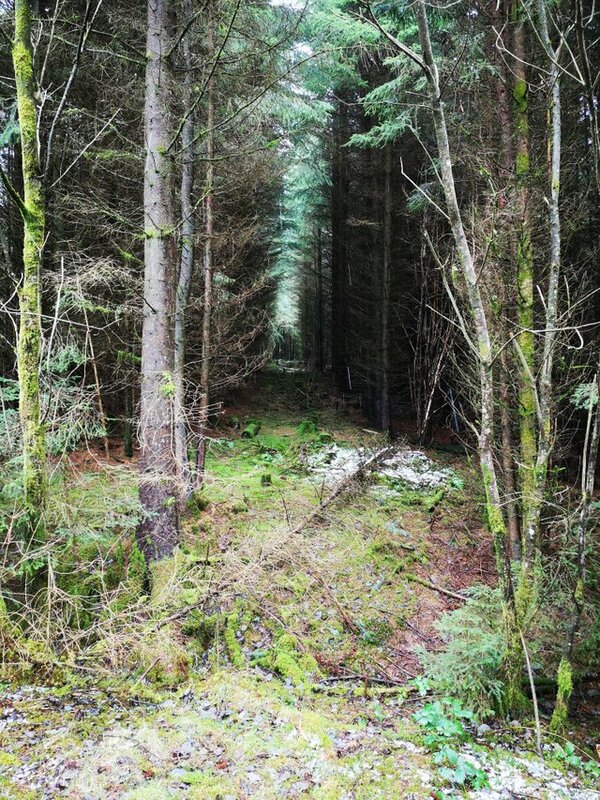 I grew up wandering around forests, so all that rotting matter is beautiful to me. I never lost sight of its connection to life. Thanks for your comment. I like very much the mening of your haiku. The portrait of the cycle in your haiku. That naturalness of the haiku gaze is what I would love to learn. Hello! Can I participate in a post as a comment instead of a post on my blog? I love haiku! It's the feeling I got from the @calluna photo. The one of seeing a forest of very old enchanted trees. I remembered the Ents, from The Lord of the Rings. An animated forest, like in a wuxia movie! De la luz de la tierra. From the light of the earth. You won't believe it, but your haiku is very similar to a haiku I wrote a few years ago. Trees look like sentinels to me too! Oh, @bananafish! I think the coincidence is in the soul of the tree. In fact, in the trees that are tall and rise towards the sky. The trees of wide and leafy crown have vocation of nest. The skinny ones, of branches in uprights, serve to contemplate themselves in the afternoons... and so on. You should place that haiku around here, and so it accompanies the sentinels of mine. Hello, @bananafish, very interesting what you are teaching us about haiku. Yes, time is a tyrant, but somehow we can "turn around it" and find ourselves in the short haiku. Good luck to all the participants of this week. Here's mine! After quite a long time I'm happy to participate and see all these positive vibes. Your small comparative lesson was enlightening in underlining the cultural difference from our western sensitiveness and the Japanese one. Thanks for your teaching Marco, a great occasion to improve. My greetings, friends of @bananafish and participants in the contest in English. I am joining very late, because in almost all of Venezuela, my country, we have been without electric service from Monday 25 from 22:30 (UTC) until today (Wednesday 27) at 15 (UTC). I leave below the link of my exercise and the text in English. Very elemental, capturing the essence of seasons and life. I wonder, does writing your poem in conditions of hardship affect the way you interpret the image? Do you think so? Hello, @agmoore. Thank you for your appreciation. If I understand your question, I would say that I try, as much as possible, that the writing of a poem is not affected by the immediate emotion that I may be living in the moment, although it is not easy to achieve. In general, I believe that if poetry is an expression of emotion, it is one that has been decanted or processed, becoming an experience (as Rilke says). In the specific case, more than the emotion affected the contextual conditions, in terms of time and technical possibilities. I had written the exercise on Monday but I couldn't post it or publish it because of the blackout. Greetings. I find I am influenced strongly by my environment, although I try not to be. I'm a very impressionable person. Your poetry is always wonderful. Los contrarios que se encuentran y hacen algo muy hermoso. Este haiku es realmente bello, querido @josemalavem. For the late and for certain haste, it is not that there is a new interruption of the electricity, I could not read all the competing exercises. Even so, I dare to give my appreciation. I particularly liked the exercises of @f3nix, @agmoore and @theironfelix (of this one, who sent four exercises, I prefer the third one). In the three indicated I perceive a special sensitivity to capture and express the significant possibilities offered by the beautiful photo of @calluna. They are configured by an expressive sensoriality (the "the shadow path" in the @theironfelix, the aroma of musk in @f3nix) but giving the opening to other meanings in a more soulful or spiritual tone (the silence in @f3nix, the "retreat" in @theironfelix). 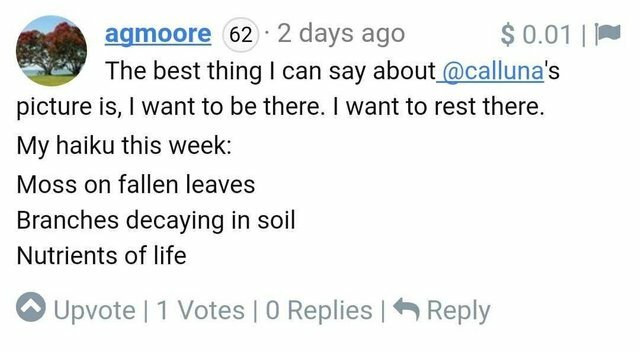 But I vote for the @agmoore. In his exercise not only highlights the dense sensory (almost comes to feel the softness, moisture and strong odor of moss and plant decomposition), but also proposes the philosophical meaning (I would say in Western key): the cyclic regeneration of natural life. In short, we could say that this week's Haikus touch on different points of life as we conceive it. But it seems to me that @amigoponc resonates very well with our passage through the world; therefore, for him my vote. The first two lines display death and decay but then the last line expresses the sustenance of nature. Life is a circle and everything that lives must die for nature to flourish. Good luck and blessings to all. Here is my participation this week. hi all, it's me again. it's my 2nd entry. Thank you @wongjava! Only one entry for each participant is allowed, but we appreciate the entusiasm! Hi friends! I forgot to bring may haiku. Excuse me! Here it is. This is my english haiku this week. God bless us. and listening the green too. 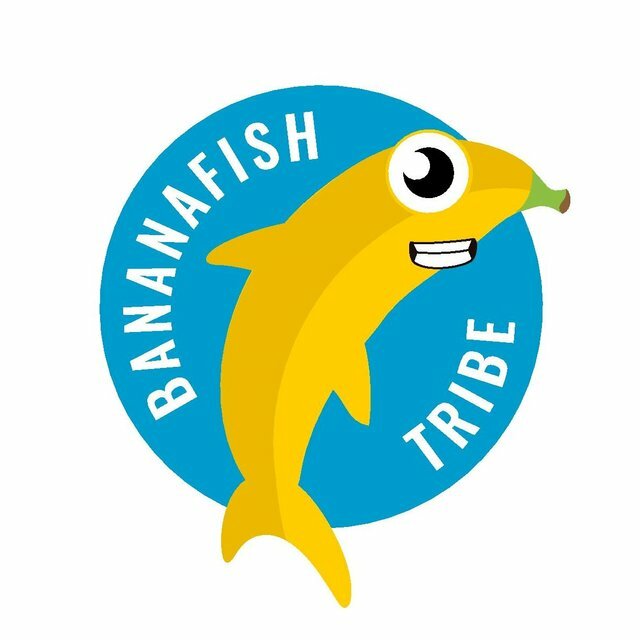 Hello, @bananafish and all you friends... I could find a little time in the middle of the Venezuelan blackout to participate in this stimulating contest.